Pioneer Village in Searcy, celebrating its 50th anniversary, will host its Fall Fest on Saturday, Nov. 3, and Sunday, Nov. 4. 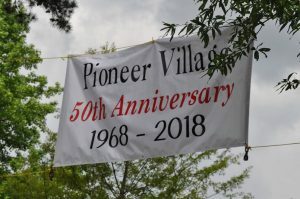 Pioneer Village in Searcy will continue the celebration of its 50th anniversary at its Fall Fest on Saturday, Nov. 3, and Sunday, Nov. 4. Pioneer Village is a collection of buildings from the late 1800s that have been saved from around White County. After the gathering of the structures, the buildings were first opened for public viewing at the White County Fairgrounds in the fall of 1968. After many years at the fairgrounds, the buildings were moved to the present location in 2002. A wonderful log house, called the Gordon House after the family that built it in 1865, is just one of the buildings in the Village. Others buildings include a one-room school/church, jail, general store, blacksmith shop, trapper cabin and the old railroad depot from Garner. You can even see how a wind mill pumps water for the farm and livestock. There are additional buildings associated with a village, a wood working shop, cotton display, strawberry shed, various out buildings from the farm as well as farm tools, farming equipment and the Village tractors. Volunteers in period costumes will be in the buildings and on the grounds to assist with information. Pioneer craftsmen will demonstrate skills such as blacksmithing, spinning, quilting, hand sewing, making rope, wood working, hewing a felled tree into a log and more. Live farm animals will be in the Rose Bud barn. Other activities include pioneer games for children, such as jump rope, stilts and rolling hoops. Entertainment includes live music, square dancing, line dancing and clogging. Food, kettle corn, hot roasted peanuts, and other refreshments are available. This is a fun, family-oriented event. There is something for everyone regardless of age. Hours are 10 a.m. to 4 p.m. Saturday and noon to 4 p.m. Sunday. The Village is located at 1200 Higginson St., in Searcy. Admission and parking are free. Donations are accepted. All donations are used to maintain and improve the Village. Pioneer Village is a preservation project of the White County Historical Society, a non-profit organization. Village volunteers are members of the Friends of Pioneer Village. White County Master Gardeners maintain the Village gardens. For more information, please call 501.580.6633 or 501.278.5010.